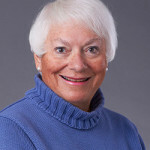 Today we focus on the very talented Amber Spiegel, popularly known as Sweetambs, who currently reigns as one of the world's premiere cookiers and whose creations delight millions. 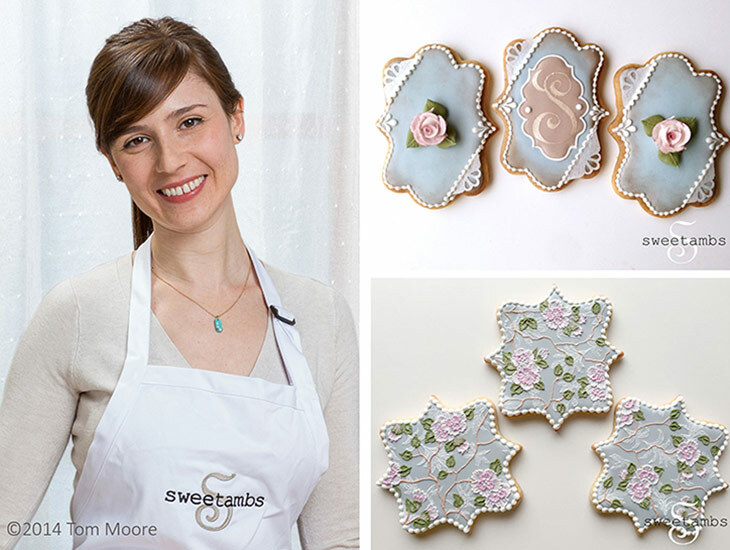 She educates the public on how to decorate cookies. Growing up in a family of artists, I always had a paint brush, pencil or marker in my hand. I've also always loved baking, but it wasn't until my mid-twenties that I decided to combine these two skills and try my hand at decorated cookies. 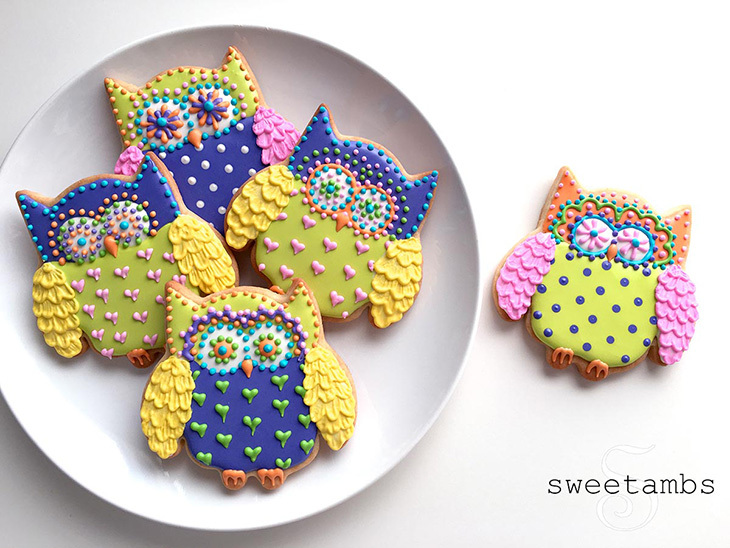 I've been decorating cookies ever since that first batch! 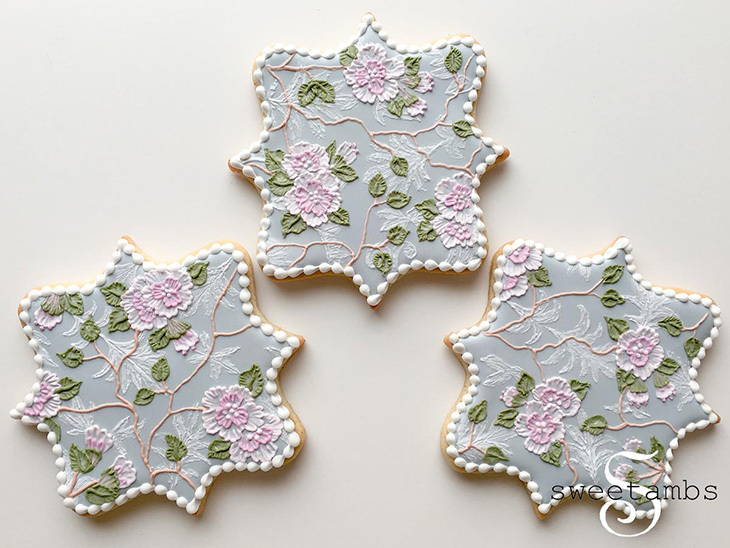 I have a degree in Baking and Pastry Arts from The Culinary Institute of America, which is where I honed my skills in baking and learned a little about royal icing. I also took the two-week Wilton Master Course to learn more about cake decorating techniques. There weren't many cookie decorating classes available when I first started, so my experience in cookie decorating came from spending a lot of time practicing the cake decorating techniques that I learned at The CIA and Wilton and applying those techniques to cookies. 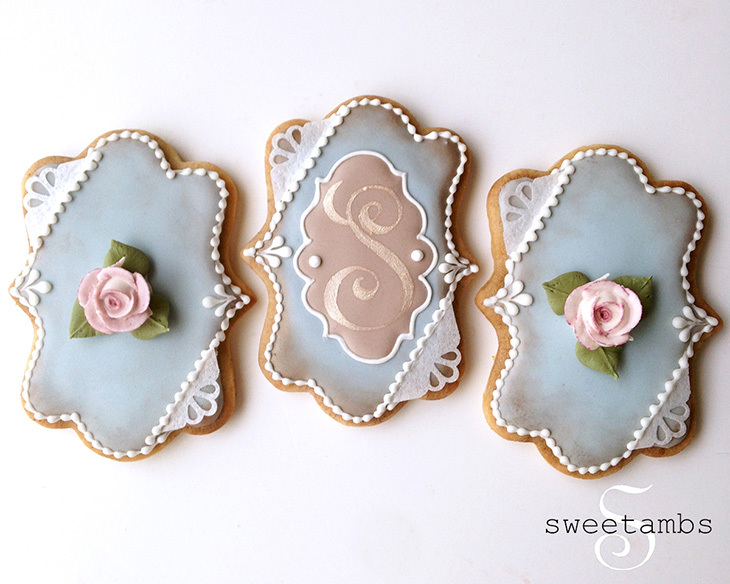 I really love the vintage look, which is the style that I focused on when I began decorating cookies. I think that's what I'm best known for. Lately I've been working with bright colors and patterns. It's fun to try things that are out of my comfort zone. I find that a lot of the questions I receive about cookie decorating revolve around problems that decorators have with royal icing. Most of the time, these issues can be fixed by not over-mixing the icing. When the icing is mixed on high speed for several minutes, it becomes very fluffy and those little air bubbles tend to cause a lot of problems later including breakage, color bleed, dull finish, and a sandy texture among others. It's best to mix the royal icing on low speed for no more than 5 minutes. The icing should be thick like a paste rather than light and fluffy like meringue. My favorite shape from Ann Clark Cookie Cutters is the Long Fancy Plaque Cookie Cutter. It's such a pretty shape that can be used for all kinds of designs. 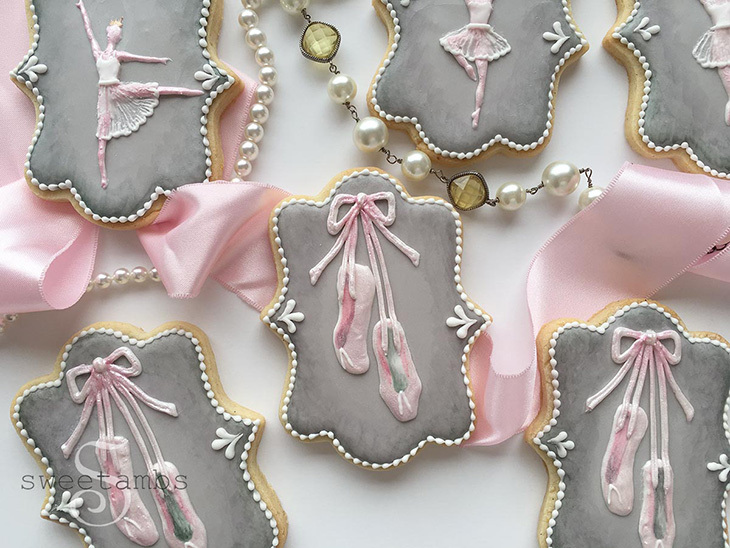 Most recently, I used it for a set of ballet cookies. Cookie videos are becoming more and more popular on Instagram and I expect that this trend will continue as more people discover the joy of decorating cookies. While I used to spend most of my time creating elaborate designs, I've changed the way I decorate because I'm posting new content more often on social media. I still go back to the old style for my full length YouTube videos, but I get a lot of great feedback on my 60-second cookie decorating clips on Instagram that show simpler designs. Those are my favorite kind of videos to make! I find inspiration everywhere! I have a collection of vintage tea cups, fabrics and other items that have inspired a lot of my designs. I also come up with cookie ideas when I'm out and about. Just the other day I found a pretty set of paper doilies at the craft store that would make a beautiful cookie design! I can't wait to try it. Hayley Cakes and Cookies – Seeing her posts on Instagram makes me happy!